Normalized Difference Vegetation Index (NDVI) at 10 m resolution near Brandon, MB, July 23, 2017. Copyright: contains modified ESA data. My Landplan Enters year two! My LandPlan helps landowners, agronomists, and Ag industries by providing mapping information that helps farms modernize, and fulfils crop health information requirements for more progressive precision farms. Growers often make incremental improvements over time to modernize their operations. The order or the number of steps for your farm may vary depending on the complexity of your land, and your history of improvements. With My LandPlan, you decide what step is important and when it is appropriate to move forward, or we can work together. Our subscription service recognizes our professional relationship over time enables us to provide competitive rates while we work efficiently together towards short or longer-term goals. FREE CROP HEALTH MAPPING TOUR! Take a free tour of My LandPlan's on-line crop health mapping service at the bottom of this page. Zoom into the NDVI data to see variation between fields and within fields. Crop health mapping is an important aim of modernization. Awareness of infield variability can lead to steps to identify and potentially remedy the causes. Some losses of production may be persistent, such as topography/standing water. In this case the loss can be remedied with a single step. Others may be shorter-term (e.g. weeds and pests) and vary by location within and among years. In either case, a crop health map can help to make your operation responsive to some causes that can decrease yield. These maps also show areas that are fine and do not need a change in practice. NDVI data collected by UAV at field scale. High-resolution satellite data are not infallible. Planning the use of satellites and UAV’s together is smarter because complementary tools are often better at getting a job done well. The timing of UAV data collection is flexible and independent of most cloud cover conditions. UAV’s provide a reliable means to monitor short-term changes in crop health. They are especially useful during persistent cloud cover. UAV’s are not well suited to map all your land in the current regulatory environment. However, UAV’s can gap-fill by mapping the fields with areas of concern already identified in the satellite crop health maps and scouting. Know your real land area, drainage, and field history? Now consider a detailed boundary map of your arable land and a precise elevation map. Our survey grade UAV’s can provide accurate field delineation and model your drainage improvement so your cost estimates for modernization steps are accurate. We can also provide a statistical analysis of in-field variation using the last 15 years of satellite data. Cutting edge modernization steps are coming! We are partners with ROGA Drone - the first company to receive a Special Fight Operations Certificate to operate a drone that can spray in Canada. We combined forces in a proposal submitted earlier this year for UAV spray trials, in response to a request for proposals by Agriculture and Agrifood Canada. NextGen and ROGA aim to be the first companies to spray from a drone in Canada. We believe crop health mapping and spraying by UAV will prove to be a powerful and flexible combination that will scale to farms over a wide range in size. Spot spraying by drones also has a lot of potential. We can identify crop health issues using satellite, then fly a multispectral drone mission to carefully map the boundaries of the spots to spray. This is then used as a precise input to the spraying drones mission plan. This will be important to government regulators and is where all three technologies converge and shine together. We are convinced that users of My LandPlan will exercise the future option to use very high-resolution multispectral crop health data as an input to plan their crop spraying missions by UAV. Very exciting stuff…members stay tuned for updates! We’ve listened to the needs of growers and agronomists at venues including the Western Canadian Crop Production show and Manitoba Ag Days. We understand your time is limited. My LandPlan is not a hands-on image data distribution portal on the internet that adds numerous technical steps to your work day just to find data. We are not a self-serve data warehouse. We notify and serve information to you via the internet, so you and your trusted partners can focus on leveraging the information. We are knowledgeable about the underlying science of imaging crop health, and are experienced at surveys and mapping. We are here for you! O.K. we've covered the basics. Now let’s make a plan for your land. 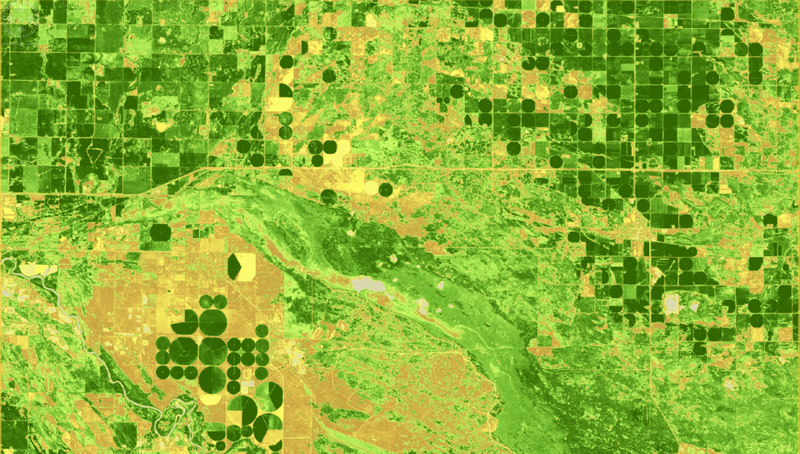 High resolution (10 – 15 m) optical satellite data in the crop health index of your choice (e.g. NDVI, NDRE, GNDVI, GRVI). There are more than 50 indices available in the scientific literature. Optional color composites are available that can use natural colors, or those used to look at in-field soil and moisture variation. Classification and area assessment of your arable/non-arable land, water, and watercourses using UAV high resolution aerial photos and multispectral images. Elevation mapping by UAV (real-time kinematic; survey grade). Drainage modelling and planning. Before and after comparisons of arable area before earthworks. Crop health by UAV - Identify your problem fields/areas or take advantage of this technology during periods of key growth/extended cloud-cover. Crop damage area assessment by UAV - have your map and total acres of damage in hand ready for the adjuster. Annual membership is free and comes with no obligation. Members are entitled access to our preferred client rates. Members whom are paid subscribers of My LandPlan gain priority access for scheduling services in the order of registration each year, starting January 1. Tier 1 registrants maintain preferred rates for optional Tier II services. Tier 1-member registration is typically done by telephone to discuss requirements. A small fee is required at time of registration for Tier II UAV work (independent of Tier I). This registration fee is deducted from the final annual cost. As an annual Tier II subscriber we then work with you on scheduling. Members also benefit from updates on industry news and trends in our gazette, My LandPlan's Insider News, and can participate in our educational webinars. We encourage you to become a member, to call us with any questions you may have, and to inquire about subscription pricing at a time that is convenient for you. My LandPlan Membership comes with a free tour of our crop health mapping system! Annual membership is free and comes with no obligation. Membership also enables access to sample crop health mapping data using our online mapping service. You will be provided a link on the thank you screen that follows the form submission. Don't forget to bookmark the crop health mapping page. If you lose the link just fill out the form again. We consider your information private and confidential. It will be secure and will not be shared. * = Required Fields. Please confirm your email address is correct, or we will not be able to provide you with incentives. If you have any questions or comments feel free to enter them here, or see the Contact page. We do not require your phone number but it is easier to call you back if we have it! Thank you for being a member of My LandPlan! Discuss our services with your peers as that saves both time and money. Click here to take a free tour of our crop health mapping service. You can easily change the basemap to Google Terrain and select each NDVI map to display under the VIEW LAYERS tab. Feel free to call us with any questions. Enjoy!